Image taken from a publication called "Isles of Mary." The above image has been extracted from the scrapbook downloaded from the Internet Archive1. The document from which it was taken was entitled “Isles of Mary” and appears to have been a publication of the Oblate Philippine Mission. “Bishop Alfredo Obviar (center) officiates at cornerstone laying of new chapel in honor of Our Lady, Mediatrix of all Graces. 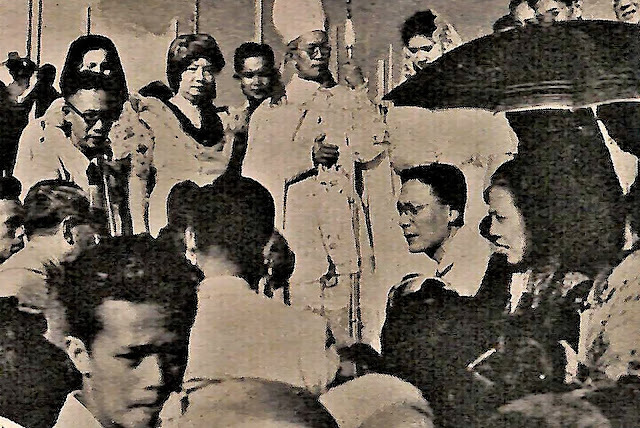 In the photo above, Mrs. Aurora Quezon, widow of the late President of the Philippines, stands at Bishop Obviar’s right. Half-hidden by umbrella is Miss Vicky Quirino, daughter of President Elpidio Quirino. Please follow the link below to read more about the Marian apparitions in Lipa in 1948 that led to the building of the chapel. 1 “Huk Ambush Scrapbook 2,” online at the Internet Archive.